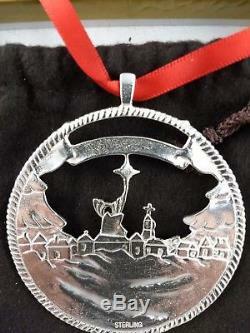 Lunt designed this unique solid sterling Christmas ornament for Neiman Marcus in 2005. It portrays the Star of Bethlehem and has the lyrics "Do you see what I see" embedded on the front. It is a rare, two-sided, ornament that is heavy (1.325 troy ounces) and large (about 3 from the top of the bale). New, unused with original box, bag, & brochure. Always stored in original box and bag. 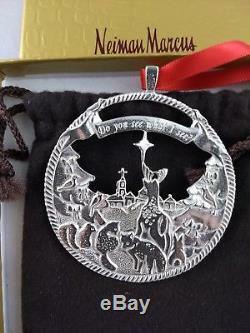 The item "Neiman Marcus Sterling Silver Christmas Ornament New, Unused, withbox & bag RARE" is in sale since Tuesday, November 6, 2018. This item is in the category "Collectibles\Holiday & Seasonal\Christmas\ Modern (1946-90)\Ornaments\Metal". The seller is "sombreroblanco" and is located in Pittstown, New Jersey.